There’s something about today that’s different from most days. I just can’t put my finger on it. Is it a holiday or something? At dawn in Waco, we await the brisket. We watch over the beans. We cool the potato salad. And we have a deeper understanding of why barbecue is what it is. But we can’t understand people right now. Remember children, you can read the funny papers, but only after you’ve read your Sunday School lesson this morning. He referred to the quote in light of voting early and after 11 people were gunned down yesterday during a baby naming ceremony at a Pittsburg synagogue. As we watch over the burnt offerings in the back yard here in Waco, let’s turn to that lesson I was talking about earlier. Then we’ll look at the funny papers. “Warshing Clothes Recipe” — imagine having a recipe for this ! ! ! This is an exact copy as written and found in an old scrapbook, spelling errors and all. Take white things, rub dirty spots on board, scrub hard and boil, then rub colored don’t boil just wrench and starch. If you weren’t sure that Halloween was approaching, the driver of this Jeep is on a mission to remedy that. Today, I saw where the inventor of the Green-Bean Casserole has died. Her legacy was six ingredients and six minutes of prep time. Dorcas Reilly died on October 15, but the New York Times just recently ran the story. I’m a terrible gift-giver. I always have been. It’s a skill that I’ve long worked to improve. For example, can’t you just see someone who would want a candle sharpener? I’m going to buy a dozen for loved ones on my Christmas shopping list. What do the call letters WBAP stand for? The world of firewood is a tricky one. The measurements are foreign to me. There are cords and ricks. There are face cords and what we have here above is a half-face cord. We’ll have to explore all of these (and barbecue) in a dispatch soon. Behind the scenes of a successful television news broadcast on a fall Friday night in Texas will most definitely include a healthy dose of football. As Texas continues to flood in the low places, one icon is ready for the rising waters. The statue of the late Stevie Ray Vaughan. My cousin Keith Earl would get a kick out of this. Keith Earl was (and probably still is) SRV’s biggest fan in the 80’s and 90’s. The CDC has actually issued an advisory about dressing up chickens in Halloween costumes. Some nights, I can’t sleep through. What I mean is, at the strike of 3 a.m. or 4 a.m., I return to the land of the living after a few hours of slumber. This morning, it was 3:33 a.m. I resist the urge to look at the mobile device that’s on my night stand. I usually give in and begin to read until I get sleepy again. This morning’s headlines included a note that Big Bird was leaving Sesame Street. The New York Times headline jarred me, but I learned through reading that, no, Big Bird isn’t going, but his handler is. Caroll Spinney played the part of the bird and Oscar the Grouch for 50 years. “I always thought, How fortunate for me that I got to play the two best Muppets?” he told the Times. Here’s the compelling story. I hope you enjoy it as much as I did. We talk a lot about the weather here. This week, it seems everybody is talking about the weather. That’s because there’s plenty of weather to talk about. From Hurricane Michael and the aftermath in Florida and Georgia… to the cold snap across the plains and southwest… to the high water here and there. Over in Llano County (that’s pronounced LAN-oh), the raging rivers have taken out homes, cars, and even bridges. The local newspaper at Llano claims this is the worst flooding of the Llano River since the 1930’s. 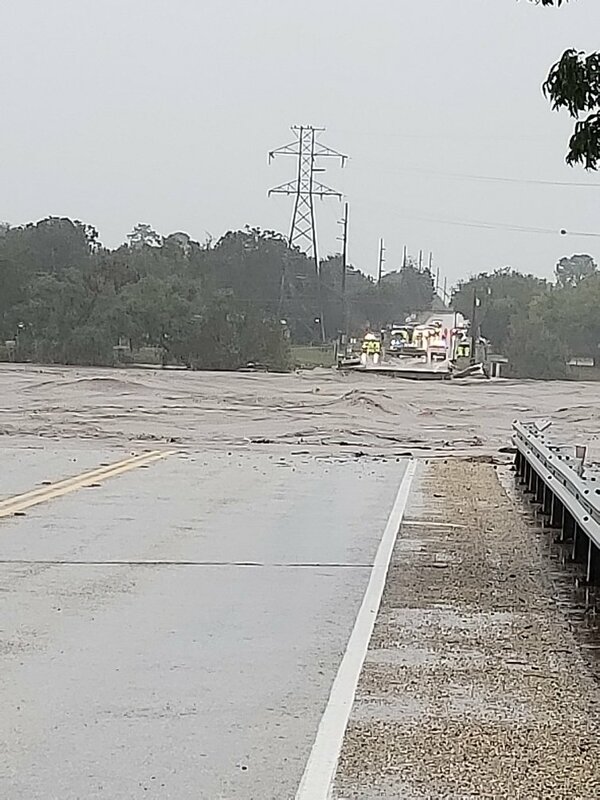 Here’s an image from TxDOT at Kingsland, Texas where the Ranch Road 2900 bridge was washed away today. You can’t tell by this picture, but it’s 43 degrees, windy, and the rain is coming down in sheets. The first cold snap of the season has finally come to visit. I’m sure we’ll all be tired of it in a week or two. Driving over your water meter can be an $800 mistake. Seasoning your new grill can enlighten you on the lessons of temperature ratings. Even for devices called fire boxes. (You can’t burn too hot in this one.) We’ll be buying some high temperature paint today. As seen in downtown Temple, Texas yesterday. Workers have gutted the first floor of an old building, but the fascinating part is up above. Tons of stucco Nd rebar are being removed to reveal the original facade. I got into a minor mode of house cleaning with a brief burst of energy last night. I only got as a far as dusting the old upright piano. That’s a task when you include dusting the 40 framed pictures on top. The piano has never been played for as long as I’ve had it. It needs lots of work before it’s in a decent condition. I don’t know if it will ever be restored to its former glory. Maybe one day. It came out of an old dilapidated house that had been damaged in the big tornado of 1999. The city was going to haul it off to the dump. In the end, the house it belonged to was demolished. The piano, built in 1913, survives as a piece of furniture to hold pictures. Sonny Carl is at it again thanks to the upcoming election for U.S. Senate in Texas. Surely, you’ve seen Sonny. Or heard of him. Now Sonny is back thanks to a political action committee and he’s salty as ever. This one is PG13 for language and may offend certain folks given the content is a sitting United States Senator. I don’t have a dog in the hunt for senate, but I laughed at the clip. That’s why I’m sharing it. Save the hate mail for someone else. I would have shared it if it had been about the other guy running. That’s my 89-year-old grandfather picking okra in his backyard this past weekend. After a weekend in the hometown, I remembered how the businesses and entities there have some of the greatest slogans. There’s a whole list here. Today is Oktoberfest in De Kalb, Texas. If you happen to be close by today, I hope I see you up town. Aren’t you glad you can come to a digital space like this and find a different topic discussed each day? Over on the social media site Instagram, the opposite is going on and it’s quite popular. There are people who post the same image every day. Some of them have thousands of followers. This one of an egg has 130 followers. The egg man’s goal is to get 1,000 people to follow his daily habit. The Atlantic has even written about this trend. I guess it’s a safe topic to tackle when you post publicly. The same innocuous image posted every day. After all, you can’t talk politics anymore with your friends and family. My old Kindergarten teacher has recently discovered Facebook and is roasting anybody who has an opinion that differs from hers. It’s both humorous and sad. I remember when this teacher would turn on the class television set to watch soap operas during the day. You know, those TV shows that seem to be about the same thing. Every day. There are 82 days until Christmas. Our friend, Shawn over at Accuweather says that means in 80 days, he’ll panic order everything from Amazon Prime and hope the free 2-day shipping works. If you’re in the mood for barbecue for Christmas, Texas A&M has a deal for you. Overnight delivery of a fully cooked brisket all the way from College Station. Emergency managers on the federal level are doing another test. This time it’s to all mobile devices. So today, you’ll get a message from Washington. Remember, it’s only a test and no, it’s not from the President. The most frightening Emergency Alert activation to me was on February 1, 2003. This was when space shuttle Columbia disintegrated over Texas on its way home. It literally rained pieces large and small over hundreds of miles. While the tragedy was bad enough, radio and television stations across the region had to active EAS protocols. The announcement from the National Weather Service was most ominous. I don’t think I’ve heard anything quite as jarring since then. If you produce a news story on today’s test, please remember you cannot use the EAS tones in your story. It is a serious FCC offense to use the tones in any manner other than a test or emergency. A while back, there was a trailer for a movie where terrorists took over the White House. The producers of that movie trailer used real EAS tones and were fined thousands of dollars. Every television station that ran the ad was also fined. You can easily see and hear EAS tones on youtube. Checking through the feeds this morning and ran across a post that caught my eye. This one from Joe Little out in San Diego on phrase usage. Joe writes, “Please. Share this with everyone you know. That’s a good tip to remember when you’re writing. It’s as important as the phrase “First Annual,” which doesn’t make sense. If it’s the first, there’s no way it can be an annual event. Instead, write “first-ever” or you can even get fancy with it and call it an “inaugural” event. Now, where were we before we got on the grammar and writing soapbox? Oh yes, checking the feeds. We used to check the mail for news and information. Now, it’s checking the feeds. For example, I read where there was a big to-do back in the hometown. A backyard party at the Blackmon’s got a little rowdy. The evidence was discovered the next morning. It wasn’t me who broke the swing. I was 204 miles away. But my luck would dictate that it very well could have been me had I attended. For all you fans of fall, happy first day of October to you. I hope you’re able to consume all the pumpkin spice drinks your heart desires. No, I’m not a fan but I won’t turn one down if ever offered. Since the clock is ticking and the countdown is on, what are you going to be for Halloween?